This was my first attempt at making sausages from scratch. Its something I have wanted to do for a long time. I have no idea why I waited so long. I’d had been missing out, they were superb. It will be a regular occurrence from now on. 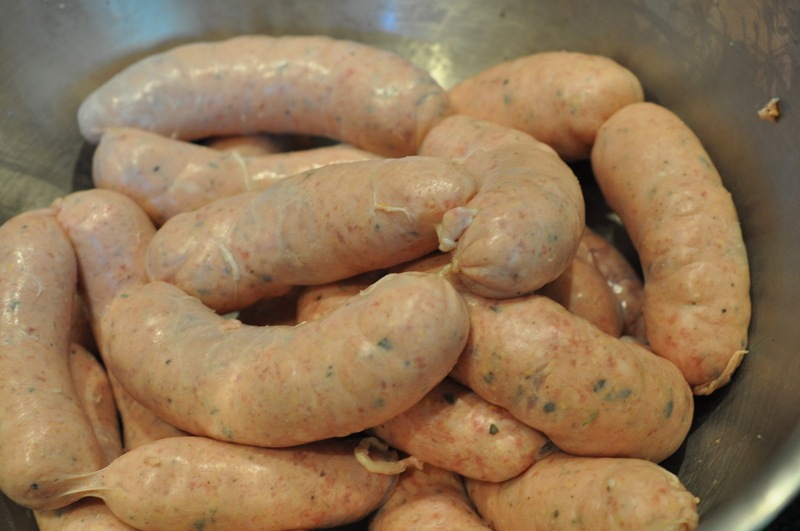 Soak the sausage casings in water for 2 hours if you are using natural casings. I used hog casings as they are the ideal size for a nice chunky sausage. 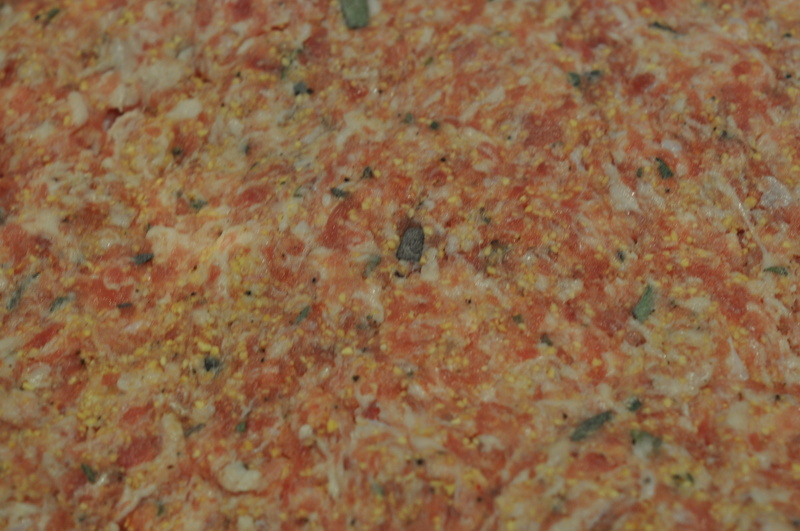 Cut the pork into chunks so that it will feed into the mincer. Put in freezer bag and place in the freezer for an hour or so to harden up the meat, especially important for the fat, it will smear rather than mince if not cold. Mince the pork and add the seasonings, rusk and cider and mix well, leave to stand in the fridge for half an hour to allow the flavours to marry and the rusk to absorb the liquid. 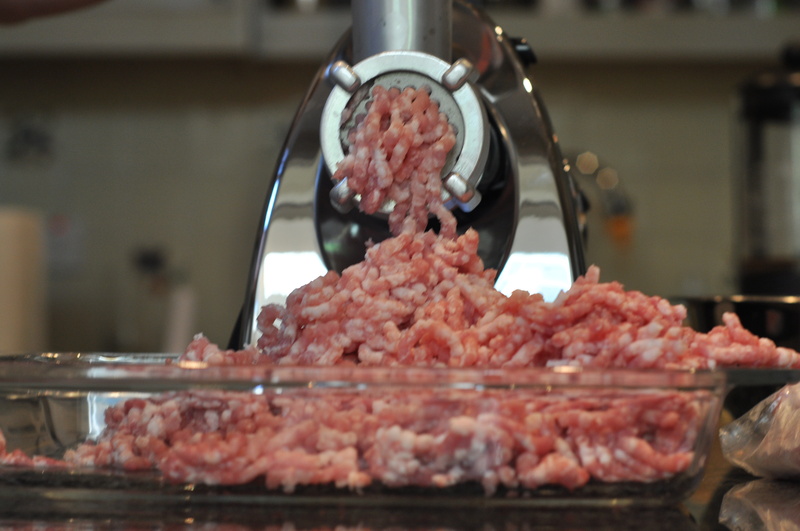 Attach the sausage stuffer attachment to the mincer and feed the hog casings on so they are bunched up but leave a little hanging over the end. Re-feed the sausage mixture through the mincer so it starts to fill the hog casings, continue until you have used all of the mixture up and you should have a nice lot of sausages. Simply twist the casings to create the size of sausage that you want.